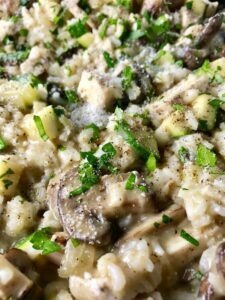 Zucchini and Chicken Rice Skillet is a creamy and flavorful recipe filled with different textures. It’s incredibly easy to make as it all comes together in one skillet. 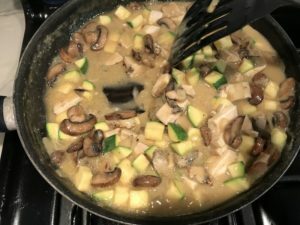 The dish has earthy mushrooms, aromatic onions and garlic, fresh and bright zucchini, hearty chicken, and rice. 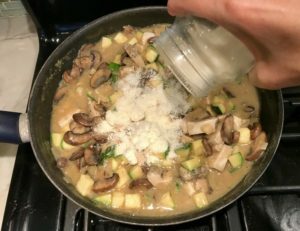 The cream sauce is light and creamy, but there is actually no heavy cream at all; instead almond milk, broth, parmesan, and corn starch create the perfect amount of creaminess. And it’s Gluten Free! Zucchini, the perfect summer veggie! 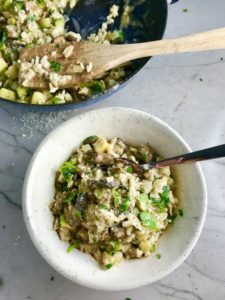 I really love this Zucchini and Chicken Rice Skillet recipe for the summer because zucchini is super good for you (see below for benefits) and it’s in season, so it’s in abundance and the price is right! You can also buy from your local farmers market knowing that you are supporting local farms! 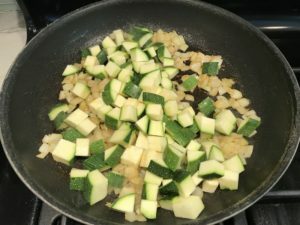 Some other great ways to use zucchini are Parmesan Zucchini Chips, layer it into an Enchilada Casserole, roast it with Red Pepper & Corn and top with an Egg, add it to a Quinoa Crust (or any other) Pizza, make zucchini noodles or just grill it. So many options! Zucchini is good for you! I feel like Zucchini gets overlooked in the health department, but pay attention, because it is really good for you! 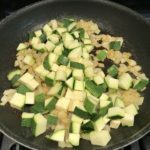 Zucchini is low in calories, carbs and sugars, so it is a great option for Low-Carb eaters or those looking to cut back on calories. BUT, and here is the part many may not realize, it is high in essential nutrients like potassium, manganese, and antioxidants like vitamin C and vitamin A. So if you are looking to replace high calorie or carb ingredients in your meals, look no further, because Zucchini is your man – or woman! Several of the options I mention above are great for just that. This recipe uses Almond Milk. Are you a fan or a skeptic? I am a relatively recently converted FAN! I was worried about the taste having grown up on regular cow’s milk all my life. But, I can tell you I love the taste! Also, unsweetened almond milk is lower in calories than other milks, it is cholesterol free, free of saturated fat, and is naturally lactose free. Most brands supplement with calcium, so be sure to check labels for content. My daughter has been drinking it since she was 4yo and loves it and I converted about a year ago. I add it to cereal, smoothies, coffee, and recipes such as this one! For this recipe, be sure to buy the unsweetened plain/original almond milk as you do not want sweetened or flavored. 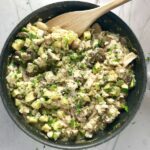 In terms of prepping ahead for this recipe, its just really getting the veggies ready…dicing the zucchini, dicing the onion, cleaning and slicing the mushrooms. For the chicken, you can roast this ahead, but my TIP: buy already grilled chicken from the deli counter or a rotisserie chicken for super easy prep. 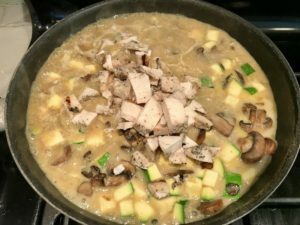 Cooking this meal is simple because everything goes into ONE skillet in stages. 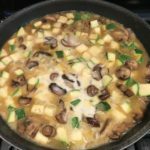 In the skillet, you will want to start with the mushrooms, onions, and garlic. These are the backdrop flavors for this dish and you want to get the flavors and aromas going early. 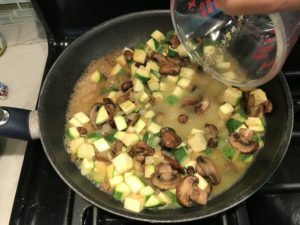 The Zucchini is added as the last veggie and only cooks for a couple minutes before adding the sauce, so that it doesn’t turn to mush. When coating the skillet with oil, I love using an Olive Oil Sprayer! You can coating a pan with oil using much less and getting an even distribution without having to brush it around. 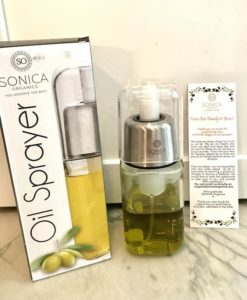 Store-bough aerosols contain chemicals and toxins, but this Sonica Organics Oil Sprayer sprays out exactly what you put into it, so you can feel good about what you are putting on your food. I absolutely love this sprayer! Now comes the sauce, which includes broth, almond milk, and a gluten free thickener. Instead of making a roux with flour, I went the gluten free route here by making a slurry of corn starch and almond milk. For this recipe, be sure to buy the unsweetened plain/original almond milk as you will not be pleasantly surprised if you get sweet vanilla! Note, just like any thickener you want to make sure you are stirring as it warms up so that when it starts to thicken it is even and not clumpy. You want to be able to see the pan when you scrape the liquid with a spoon. After making the sauce, add the diced chicken, the parmesan cheese, the cooked rice, and some of the parsley to taste. Mix to combine. 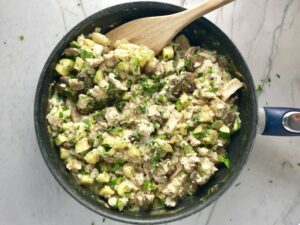 Zucchini and Chicken Rice Skillet is a creamy and flavorful recipe filled with earthy mushrooms, aromatic onions, fresh and bright zucchini, hearty chicken, and rice. It's incredibly easy to make as it all comes together in one skillet. The cream sauce is light and creamy, but has no heavy cream at all. 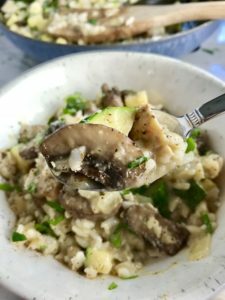 This is a summer recipe that's a gluten free, easy recipe, and a one pan meal! 8 oz Chicken Breast TIP: Buy rotisserie or grilled chicken from the deli to save time! 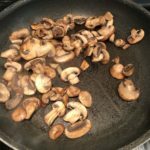 If your mushrooms aren’t already cleaned and sliced, wipe the dirt off with a paper towel and cut them into 1/4 inch slices. Store in fridge. Dice the zucchini by cutting it in half lengthwise, then into quarters. Slice into 1/2 inch sliced triangles. Place in storage bag in fridge. Dice the onion. Place in storage bag in fridge. Mince the garlic and store separately in fridge. Rough chop the parsley to get 3 Tbls. Place in storage bag in fridge. Chicken: if you need to cook the chicken, then preheat the oven to 400 degrees F. (Note my tip in the ingredient list to buy rotisserie or grilled chicken from the Deli to save time). Put the chicken breast on a baking sheet and rub with a drizzle of Extra Virgin Olive Oil and then lightly season with salt and pepper. 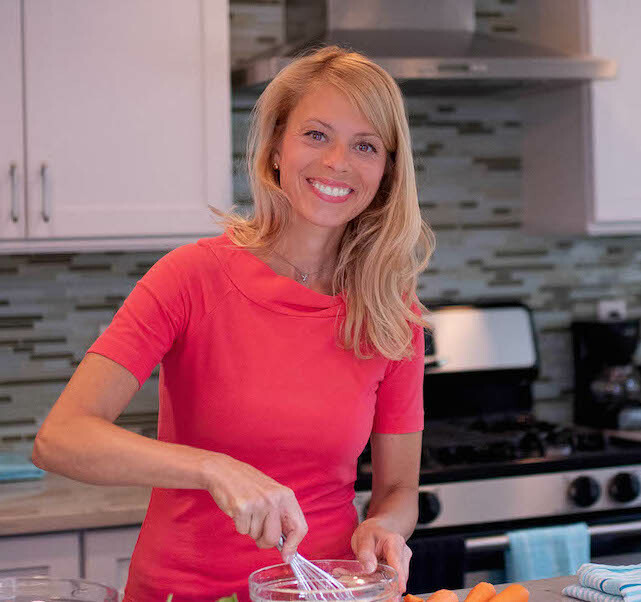 Bake in the oven for 20 minutes or until internal temp reaches 165 degrees F.
When the chicken is done, dice it into bite-size pieces and store in the fridge until ready to cook the meal. NOTE: you could cook the rice ahead of time and store in the fridge until ready to use. 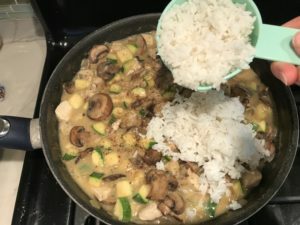 I would just reheat the rice prior to adding to the skillet on meal night as it gets added last and it will cool down the skillet if added cold..
Make the rice according to package instructions. NOTE: You could do this step in advance if you prefer to save more time. Get a large skillet and preheat on high heat. Add 2 tsp Extra Virgin Olive Oil to coat the bottom and then add the sliced mushrooms with a dash of salt and fresh ground pepper. Spread the mushrooms into one layer and cook for 5 minutes to get a brown sear on the bottom. Then stir and cook for another 2-3 minutes until reduced in size by half. Remove from the pan and set aside. Add another tsp of olive oil to the pan and then add the Onions to cook for 6-8 minutes until the onions are soft and translucent, stirring every few minutes so that the onions don't burn. Then add the Garlic to the onions and cook for another 1 minute. Turn the heat back up to high heat and add the diced zucchini with a dash of salt and pepper. Cook just until you get a sear (just a few minutes), no further as you will be cooking the zucchini as you go and you don't want them to get mushy. 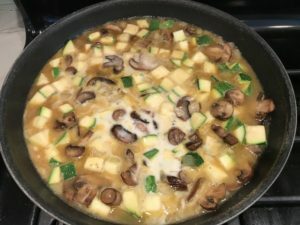 Then add the mushrooms back to the pan with the zucchini and onions. Measure out 1/4 cup of unsweetened almond milk and whisk in 2 tbls corn starch with a fork. When fully dissolved, add another 3/4 milk and mix. Set aside for now. To the veggies in the skillet, add 1 cup of chicken broth. Then add the Milk and Corn Starch mixture and bring to a simmer in the skillet. You will see it start to thicken, so be sure to stir so that it thickens evenly and doesn't clump. Add the diced chicken, the parmesan cheese, and some of the parsley to taste (save some for garnish). Mix to combine. Finally, mix in the rice. 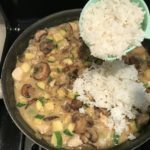 NOTE: If all of your rice does not fit into the skillet, you can place some of the rice into the servings bowls/plates and pour the Zucchini & Chicken Rice mixture on top. Serve, garnish with fresh parsley, and ENJOY!